Garth Arum is probably a new name to many a Metal music lover, and that's not so surprising...because it is the solo outing of a musician by the name of Nightmarer...whom in normal life is known as singer/ guitarist Óscar Martín of Madrid based Avant-Garde Metal outfit As Light Dies. As those in the know may tell you, ALD originated as a project in 1998, and didn't grow to an actual band until 2003. Going through several line-up changes, that band so far delivered two unofficial (in 2003 and 2004) demos, followed by an official demo (in 2005), the EP-single Gea (2006) and the full-length albums A Step Trough The Reflection (Mondongo Canibale Records, 2007), Ars Substitution From Within The Cage (BadMoonMan Productions, 2010) and Ond: Enslaved Tribute (Pictonian Records, 2012). Over the years, Martín himself has had moments where he was live musicians for other bands (Bloodline and Hybrid), been in some smaller bands abut which I found no other info that their names (Amargora, Fatalitas Band and Ildûr) and fiddled around with several side-projects (Aegri Somnia, Der Kartoffelkult, Fu Fu), which apparently never produced any (musical) output (as far as I know). With the tenth anniversary of his main band coming up, Óscar got to reflecting about finishing up some projects from the past, and one of the first things he got back to, is this Garth Arum material, which he started to compose in 1997, and more or less finished in 2003, but never published or recorded. Which is amazing, because on the project's facebook page (www.) facebook.com/gartharum, Óscar...or, rather Nightmarer...mentions that there's enough material for 4 albums, which will be delivered in the future, in the chronological order the musician followed ten years ago. Although a solo project, Nightmarer díd make use of some friends to add extra flavouring to the album. Paying most instruments (guitar, bass, keyboards, whistle ad drum programming) himself, he had one “Strudle” (most probably his bandmate Jesus Villalba from ALD) come in to play the violin in one track (“Trip (Part I)”), and had extra singers in for diversity : extra male vocals by one “Slo” (of Smohalla) on the track “Rusty Hands” (of which the man also wrote the lyrics), and female vocals by (in order of first appearance on the album), Cecilia Tallo of On3ric4 (on the songs “A New Creation” and “Trip (Part II)” - she also contributed lyrics to the latter), Lady Carrot of Aegri Somnia (hey hey...rewind...yep, the same “side-project” as mentioned above!) (on the songs “The Path To Oblivion”, “Labyrinth Of Lies”, and “Trip (Part I) – also delivering lyrics to the latter), and Camille Giraudeau of Stagnant Waters (on the track “Yearned Freedom”. One side-note here : I have never heard music by ALD, or at least not knowingly, but if indeed the Avant-Garde Metal of ALD can be described as including elements of Folk, Black/ Doom, Progressive Death, and Gothic, then I can say that this same description also holds for Garth Arum. And, as you'll be able to hear for yourself when listening to the album (it is posted in its entirety at BandCamp...find the link at the aforementioned facebook page), the vocals go from Blackened screaming to Death growls, to clean...nice contrasts. In essence, an album well worth picking up. Makes me wonder why Martín had it printed on a Russian label known for it limited copy output, because I'm sure the album is gonna land into many a critic's year-list! And for the fan, it may be difficult to get a copy, see? 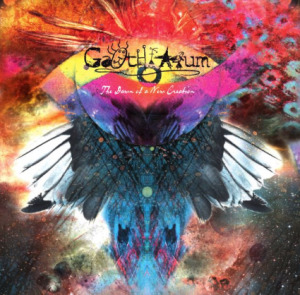 Ach well...as a privileged music fan, I am already looking out for the sophomore Garth Arum album with positive anticipation!